I suspect one reason that Shannon's work is less familiar than it should be is that it lies buried deep in the ICT architecture. I was primarily a programmer for a number of years, but as someone writing applications - programs for people to use - I didn't have to give any thought to Shannon's theories. They were embodied by engineers at a lower level than I ever needed to access. In fact, I'm ashamed to say that when I was programming, though I could give you chapter and verse on Bill Gates, I'd never heard of Shannon, even though he was still alive back then. What Soni and Goodman do really well is to give us a feel for Shannon, the man. The writing has an impressive ability to put is into the home town of Claude Shannon, or the corridors of Bell Labs as he rides his unicycle along them. At first glance, Shannon might seem quite similar to Richard Feynman in his combination of playfulness with amazing insight. But it soon becomes clear that Shannon was a far less likeable character - more introverted, dismissive of those he considered an intellectual inferior and with no real interest in helping his country in the war or with codebreaking, more undertaking this if and only if he could be offered something he found mentally stimulating. Soni and Goodman seem to find his obsession with juggling, unicycles and building strange contraptions endearing, but I'm not sure that's really how it come across. I am giving this book four stars for the biographical side, which works very well, but there are some issues. 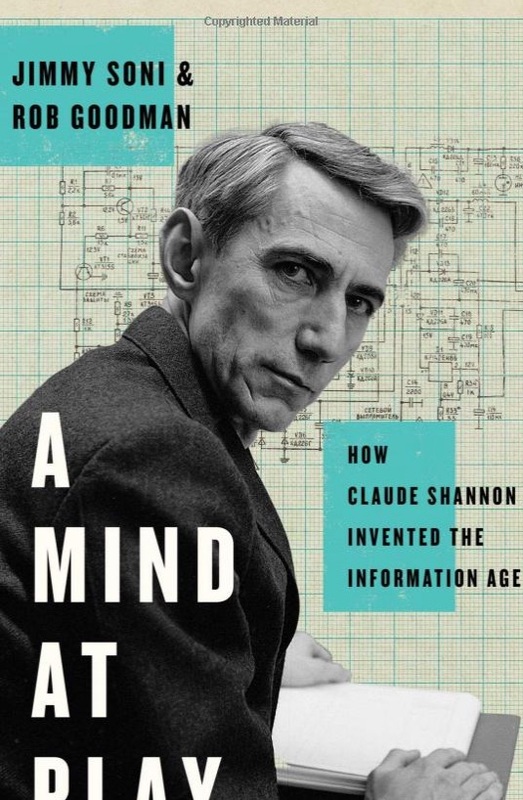 One is hyperbole - there is no doubt that Shannon was a genius and made a huge contribution to our understanding of information, but we really don't need to be told how incredible he was quite as often as this book does. At one point he is compared with Einstein - with Einstein arguably coming across as the less significant of the two - this seems to miss that part of Einstein's genius was the breadth of his work from statistical mechanics through relativity to quantum physics. While Shannon's personal interests were broad, his important work lacked that range. The bigger issue was that I had hoped for a scientific biography, but I only really got a biography with a bit of science thrown in. The coverage of Shannon's information theory was (ironically) rarely very informative. I would have loved to have had the same level of exploration of the theory as we get of the person - but it's just not there. Of course, the theory isn't ignored, with a few pages given to each of the two big breakthroughs - but there could have been a whole lot more to make what can be a difficult concept more accessible. I ought to stress that using the term hyperbole should not in any sense reduce the importance of Shannon's work. Hearing of Shannon's initial inspiration that logic and electrical circuitry were equivalent comes across rather like Darwin (and Wallace)'s inspiration on evolution by natural selection. It appears blindingly obvious, once you are told about it, but it took a long time for anyone to do so - and it's hugely important. Shannon's second big step, which provides a generalised model for information transmission with noise and makes the whole understanding of information communication mathematical was inspirational and up there with Turing's universal computer. What's more, it has applications well outside the IT world in the way it provides a link between information and entropy. If there were a maths Nobel prize, as Soni and Goodman suggest, Shannon definitely should have won one. This is a man we needed to find out more about - and we certainly do. I just wish there had been more detail of the science in there too.